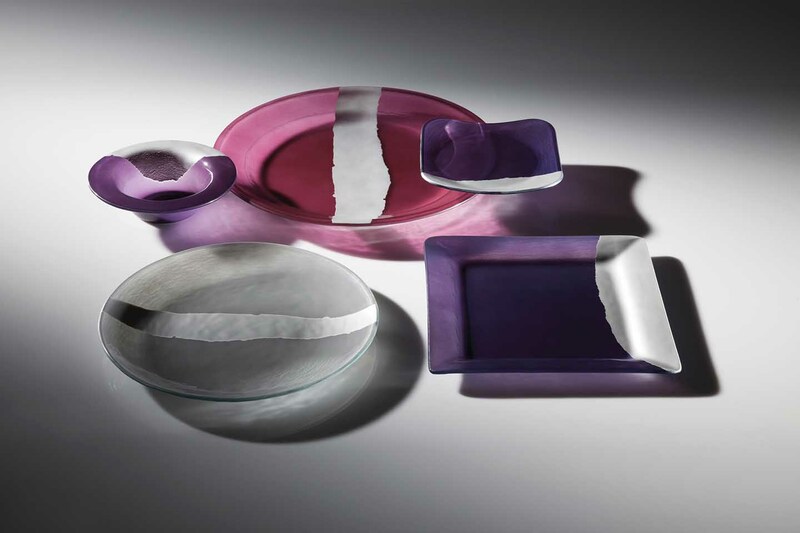 The Classic Glass Designs of Annie Morhauser This week I’m presenting—and applauding—the great California glass designer, Annie Morhauser, who is celebrating thirty years of success for her tableware company, Annieglass. 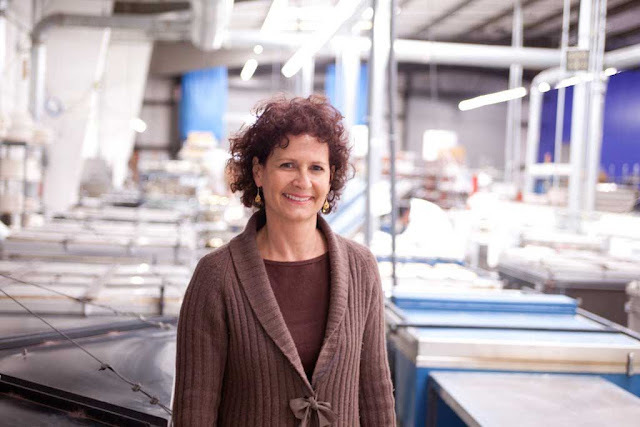 She founded her privately owned glass company (with a $200 kiln) in 1983 in Santa Cruz—and has been making glass tableware with great success ever since. Glass! 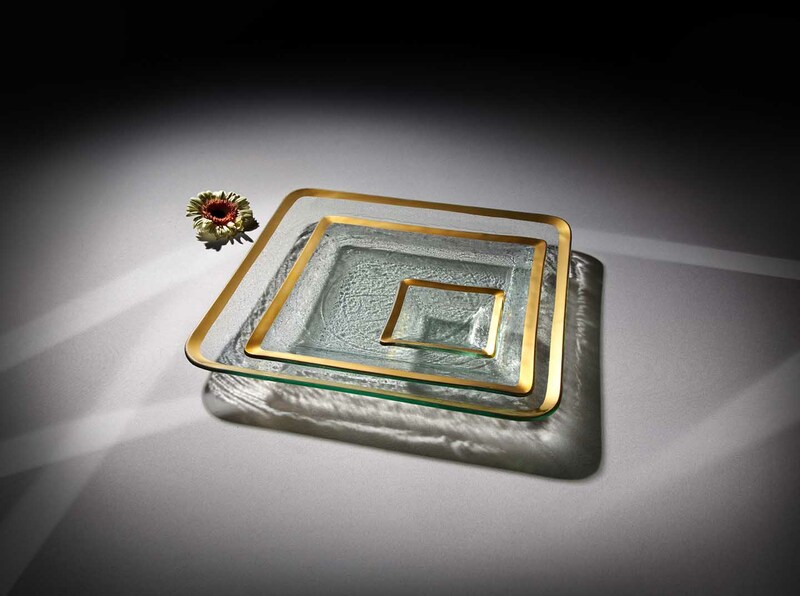 Who’d have thought that glass plates (hers have chic gold and platinum borders) could be so durable, versatile, and practical. Who could have known that her singular idea would be so successful, and that she would today be shipping something like 60,000 to 80,000 pieces a year from her California operations centre? In top style stores like Barney’s and Gump’s, Annieglass plates and bowls and cake pedestals are sold alongside Herend, Havilland, Royal Crown Derby, and Mottahedeh or Georg Jensen or Fornasetti or Baccarat and Christofle. 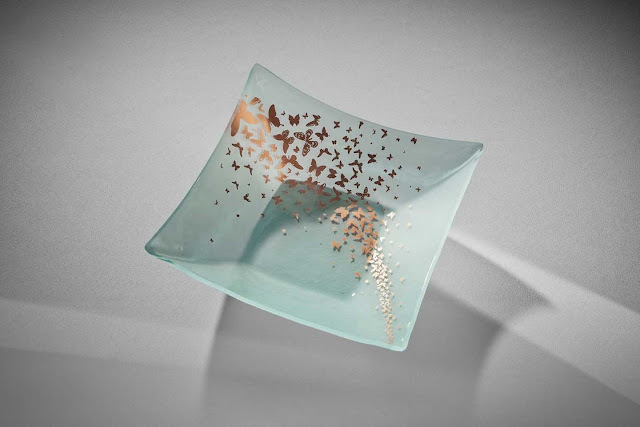 I’ve been following Annie’s superb glass tabletop designs for years. At home I often enjoy salads, a sandwich, or perhaps a slice of cake, on one of Annie’s Roman Antique plates, with a gold or a platinum border (see photos). This morning, I made a glorious seasonal breakfast fruit salad—white nectarines, raspberries, white peaches, kiwi, mango and blueberries, plain Greek yoghurt, a splash of Italian chestnut tree honey—and served it on my Annieglass platinum-rimmed glass plate. 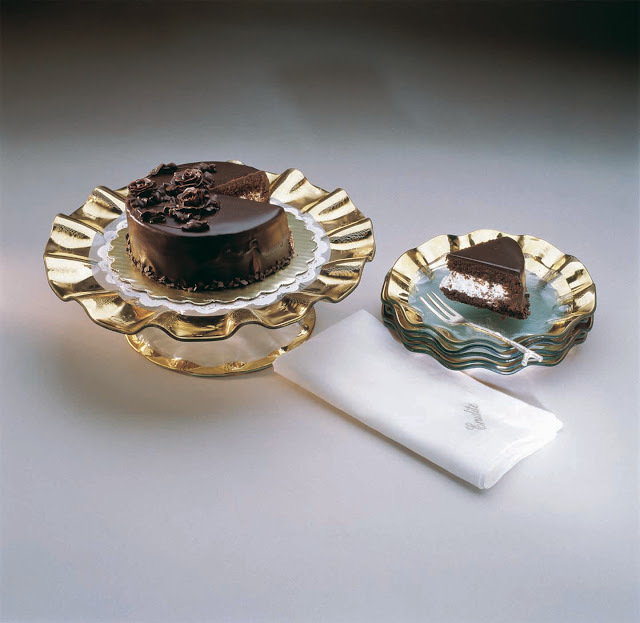 I’ve attended weddings—for which Annieglass custom-made gold-rimmed glass plates and cake stands. I’ve dined at restaurants (the Bellagio, the Four Seasons in New York) where salads or pastries or migniardises were served on Annieglass gold-rimmed plates. Lovely. Annie Morhauser, whose 30 different glass collections are crafted in the U.S., at her Watsonville studio/operations center, is now celebrating three decades of success, innovation, and consistently elegant designs. She’s a mainstay in U.S. bridal registries, and holds a cherished place at the heart of restaurant tableware design, is beloved by leading catering companies, and is the secret vice of accomplished hostesses around the country. Sit down with me for a chat with this incredibly talented and vibrant designer and accomplished businesswoman—and you’ll see images of her greatest hits, and her designs I love the most. I first met Annie at her Santa Cruz studio ages ago—and I’ve been following her swift career success every since. Annie fell in love with glass when she was a nineteen year old art student, and was introduced to the art of blowing glass. She was instantly hypnotized by the undulating half-liquid, half-solid material that seemed to be a melding of art and dance, and decided to make it her medium. 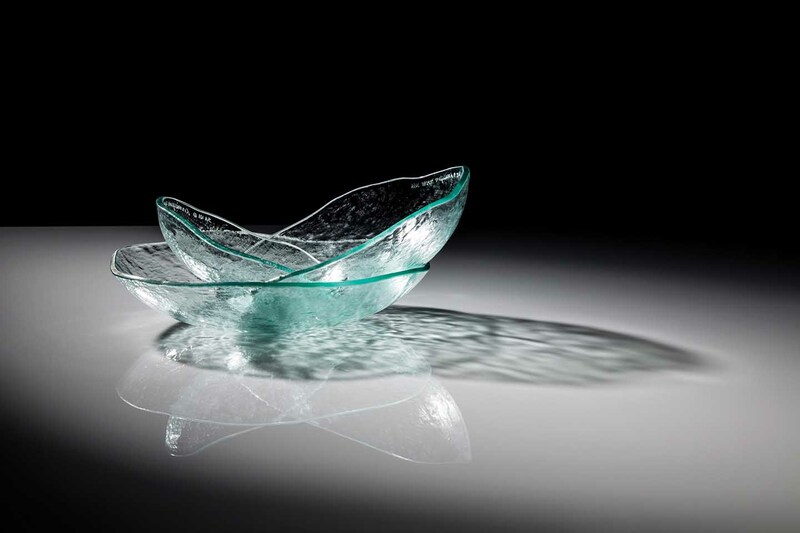 Immediately hooked, Annie got a scholarship to California College of the Arts in San Francisco where she was fortunate to study under renowned glass artist Marvin Lipofsky, one of the main catalysts of the American studio glass movement and founder of the Glass Art Society. Lipofsky’s work is displayed at the Metropolitan Museum of Art. 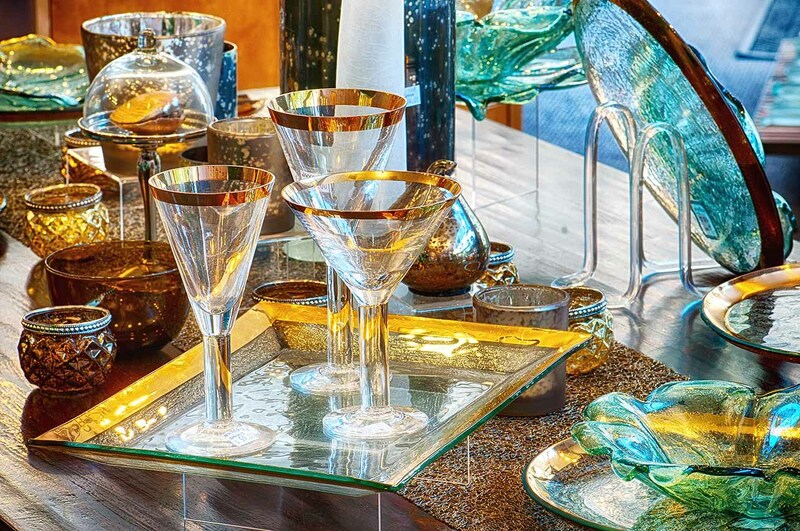 At that time, art glass was the focus—and fine glass tableware did not exist. She once tried the slumping process on wood and set the school’s ovens on fire. Once she put so much cobalt in her glass that she turned the furnaces blue. On a lark she once made an entire evening gown out of glass (which led her to receive a humorous award for “Best Dressed Glass Artist” by the Glass Arts Society). Annie planned to be a fine artist, but then a few years later decided to make an unusual dinner plate. 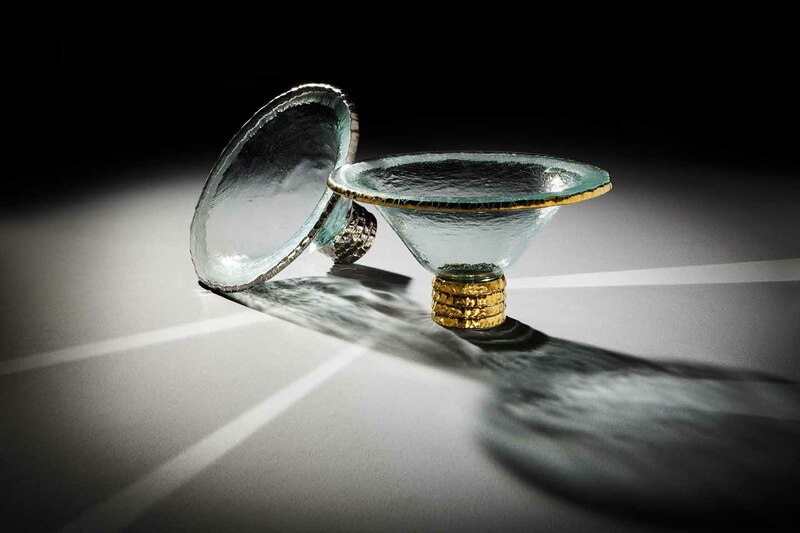 In a spoof of traditional fine china, she decided to create a collection of thick glass with widely painted rims of pure 24K gold, inspired by the Italian relics she studied in museums. She took them to a trade show in 1983. Today, her “Roman Antique” collection is an industry icon. 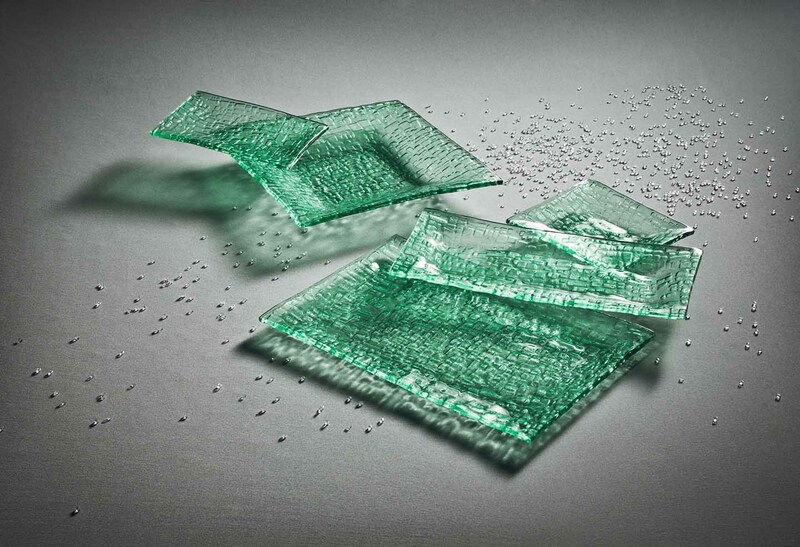 Annie fought for her work to gather clients and respect-- plates of glass seemed an oxymoron. Hers were highly crafted and well-made. 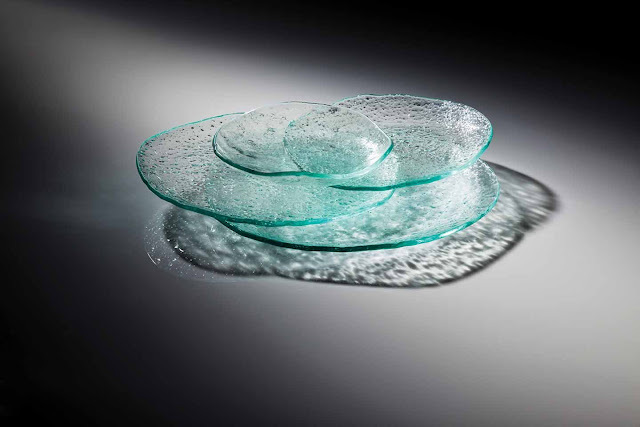 Annie uses a unique slumping process, which creates extremely durable, chip-resistant glass by grinding edges round, allowing a very slow annealing (cooling) time, and using window glass, which is much more durable than traditional lead crystal. Twenty-five full-time employees handcraft more than 60,000 plates, bowls, serving dishes and decorative table accessories annually. 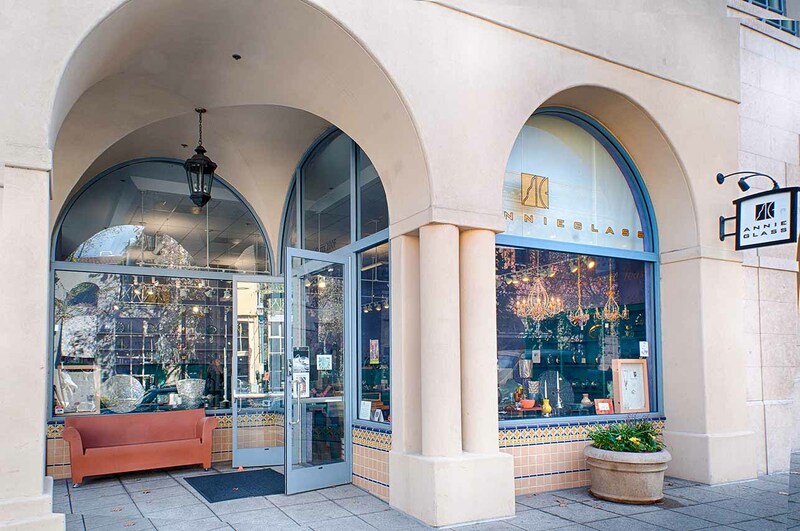 To have a thriving artistic facility on the central coast of California is almost unheard of, as most of her competitors produce in Eastern Europe, China and beyond. In 1994, Annie launched a retail store in downtown Santa Cruz, where her works are displayed in a colorful little gem of a space, also featuring glass, ceramic and jewelry work by other artists. 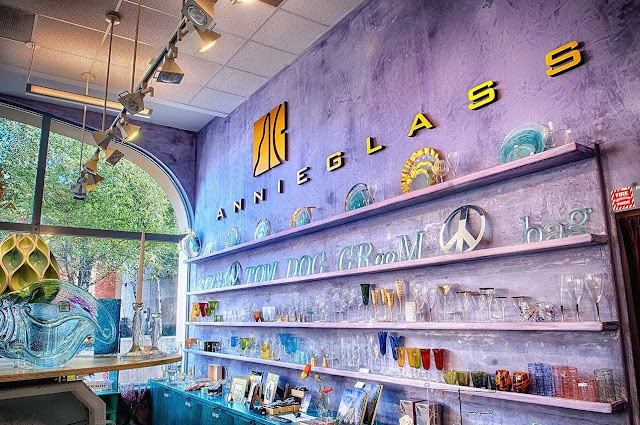 Thirty years later, Annie’s passion for glass has not diminished. Annie told me she finds her inspiration from history, travels, and nature, particularly her surroundings on the California coast. Her philosophy is to find true beauty in what’s imperfect, which is reflected in the soulfulness of her work, from the handmade ceramic molds to the ancient slumping process to the individually crafted pieces. Pieces that are seemingly imperfect—age, cracks, lines, rust—all have an element of beauty. In 2006, the Smithsonian American Art Museum selected Annieglass pieces "Tiburon" and "Coquina," two distinctive designs from the Shell Series, as part of its permanent collection in the Luce Center, which displays more than 3,000 artworks from the Smithsonian. Ann Morhauser is a fundraiser for local charities, a trustee of her alma mater California College of the Arts, and is an enthusiastic mentor for women business owners. Very active in fundraising for environmental causes in the Monterey Bay area, she also donates all proceeds from her Seafood Watch collection to the Monterey Bay Aquarium. 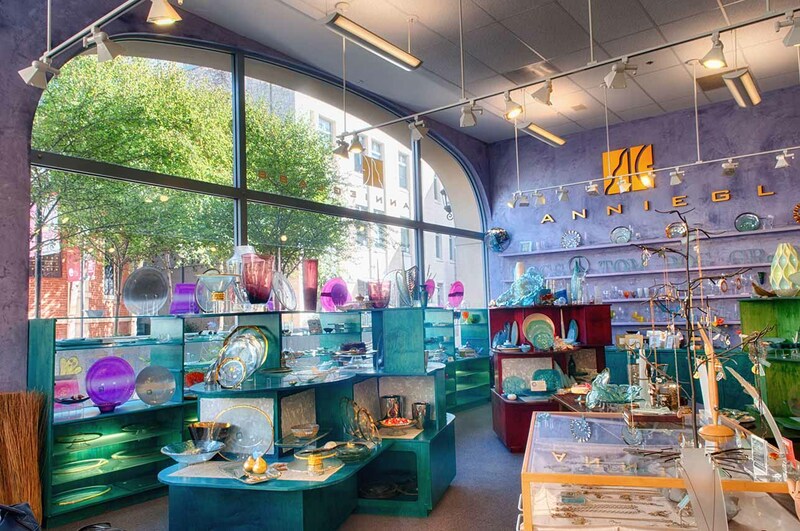 Annieglass also sponsors three educational scholarships – at CCA, San Francisco State University, and a local high school. 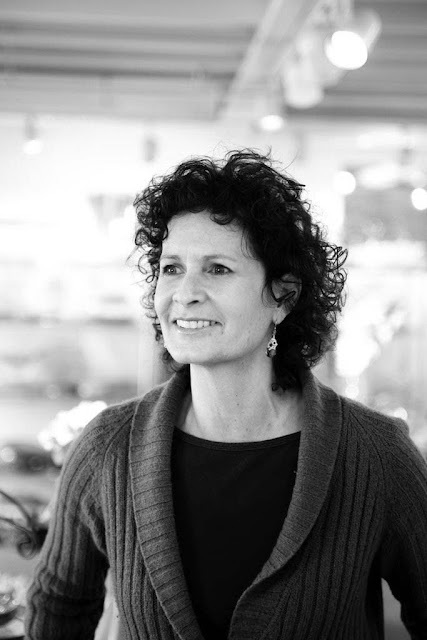 In the fall of 2008, Ann Morhauser was appointed to the faculty at California College of the Art’s innovative new MBA program for designers. A Chat with Annie Morhauser: she reveals the secrets of Annieglass, the practicality of glass, her design concepts and ideas, running a business, and why she focuses only on tableware. DDS: Congratulations, Annie, on thirty years of experimentation, new designs, daring concepts, new ideas, and great success in the marketplace. You’ve made glass chic. AM: Thanks Diane, you have always been encouraging and supportive. I appreciate it. It has been fun. I feel very lucky to get paid for what I love doing for a living. I would do it anyway! DDS: The first design was Roman Antique...and it is still in your collection and a best-seller. 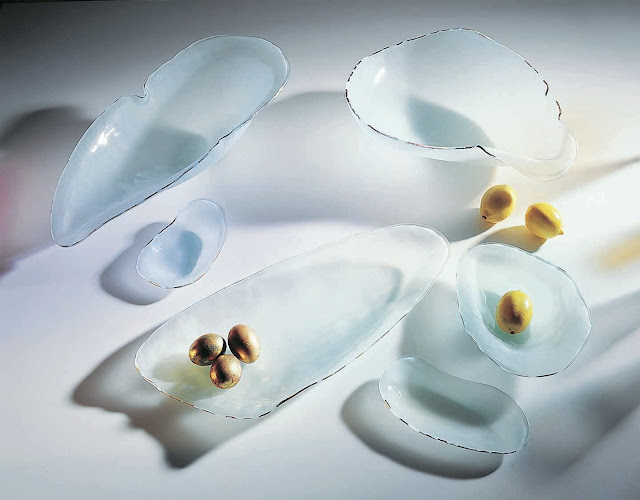 AM: Roman Antique is a line of glass dishes, platters and bowls with a gold or platinum band around the edge. They are made of glass that has a green edge and is a quarter inch thick with the texture of the brush stroke showing through. Most people want to touch it when they see it. 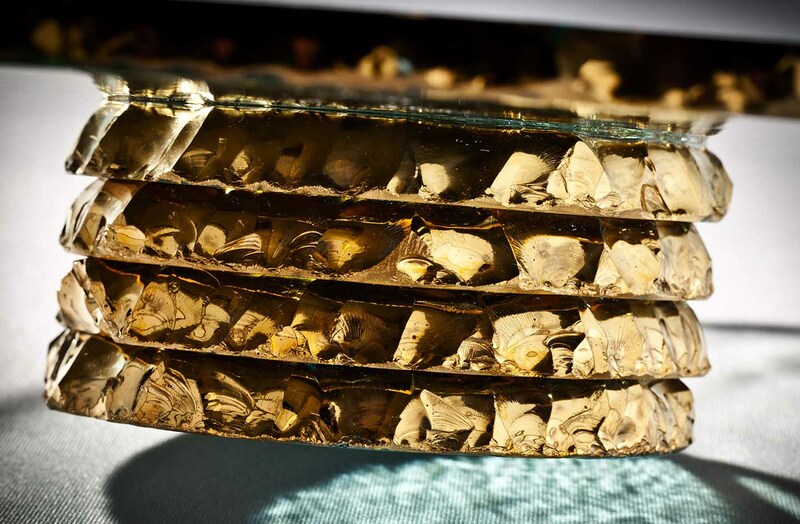 Because it is made of window glass and is heated to melting temperatures, the gold or platinum is very lasting and can be used in the dishwasher. The precious metal is actually melted into the surface of the glass in a process called slumping or bending. Glass might seem too fragile for everyday, but Annieglass is known to be very tough and sturdy. It is chip resistant and more durable than porcelain or bone china. The fact that it is dishwasher safe has made very popular. DDS: Your gold and platinum borders are always made by hand, finished by hand and each plate is signed. 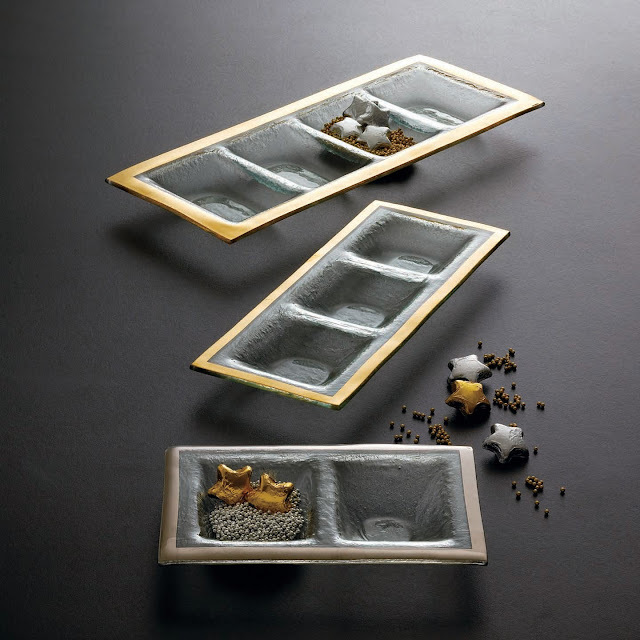 Each piece is individual, hand-crafted. AM: We use a banding wheel for the round pieces; a round circle of glass is spun on the wheel as we apply the precious metal band. After the pieces are fired in the kilns they are cooled and the Annieglass studio signature and copyright are applied along with a code we use for the date and Made in USA. We are very proud of our work and sign every piece. DDS: These designs became incredibly popular for weddings and for bridal registries. Roman Antique is the ‘starter elegant set’ for many brides. AM: And everybody gets married at some point- some even more than once. Weddings are a big part of our business and we do a lot of business in the American South where there are many independent stores and few department stores or chains. I travel there often for special events, discussions with buyers and merchandise managers. I love it. DDS: Then later you expanded to that wonderful 'frosted' finish that looks almost pale green. AM: The first was Shell Series. It is sandblasted on the back of the glass. The pale green comes from the iron in the glass. If you look closely at what you might assume are clear in color of my designs you can see the green edge. For Roman Antique, I was able to copyright it for three specific reasons: the thick, green edge of the glass; the texture and the unevenness, and imperfections of the gold or platinum bands. Like others of my designs, they are copyright. I’m proud of that. DDS: Then you were selling at Barney's around the country...and suddenly you had how many accounts? AM: It grew pretty fast to 500 accounts. We still sell to Barney’s New York around the country, and we make something special, just for them. A new example is Edgey, my new design with a very thick ‘chipped’ edge covered in gold or platinum. It comes as bowls or platters but my favorite is the stacked cake stand or trophy bowl. I just love seeing that ‘chipped’ and stacked edge of the glass. 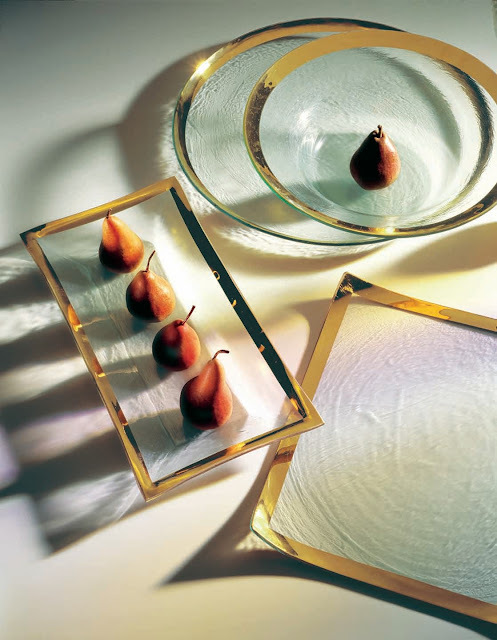 DDS: And you introduced decor for the table, pedestals and platters and bowls and serving pieces, by special request. AM: Every year I would introduce something new. For the last fifteen years or so I introduce new collections or new items within a collection twice a year in concurrence with the show season that my buyers shop. I am always working on something new. I do not work on commissions but I will follow a good suggestion when I hear one. The women who sell Annieglass are always helpful that way. DDS: What was the most dramatic response you ever had to a new design? AM: Such a great question! Having one of my pieces sent as a gift to the Pope was awesome (I hate that word and I do not use it generally). It was a large 14” heart covered in gold/ I happened to be working in the store and completely misunderstood that this special order was going to THE Pope. I thought it was going to the customer’s cousin who worked for the pope and offered to Google his address! So I could engrave on the spot and get the spelling correct…that was nerve wracking engraving it for the Pope, I was so worried I would make a mistake. There is no correcting etched glass. 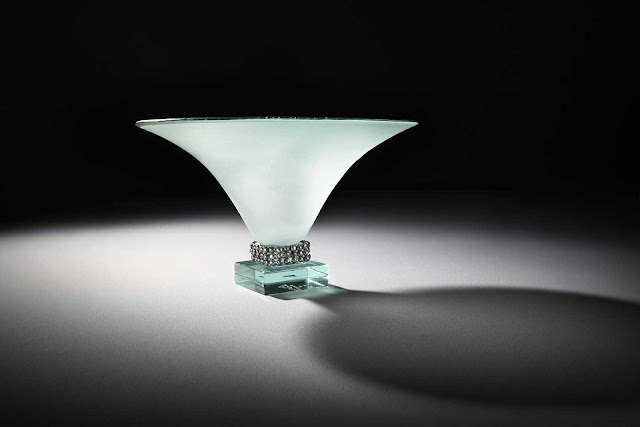 The Smithsonian asking for two pieces to become part of their new museum in 2006, The Luce Collection of American Craft. Customers have made sinks out of my several styles of my Ultramarine blue bowls. Using one as a baptismal font was impressive- they sent us a picture of the baby being held over the bowl and baptized in a private chapel. I’ve been told by stores that Oprah Winfrey collects my designs, as well as Jennifer Aniston. And I permanently sell to hotels such as the Ritz Carlton, the Bellagio, the Four Seasons and many leading restaurants. Some of my customers recently bought my new limited edition cone vase sight unseen. That was dramatic. DDS: Do you have a favorite? AM: The Footed Cone vase I reinvented with black pearls for the anniversary thrills me. I like to keep it within my eyesight at work so I can remember why I get up in the morning. 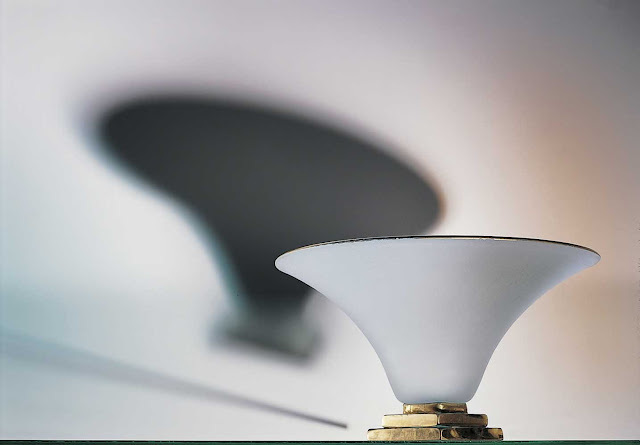 Others that thrill me are the Edgey pieces, and the Volute bowl in the Shell series with the frosted pale green texture. Dew Drops I also did for the 30th anniversary in a limited edition. I wanted to show the subtly of water drops on a flower. I used Swarovski crystal very sparingly on the petals of flower shaped glass bowls. They are in a darker pale green with more texture that anything else I have made. I like the tension between the crystal and the matte finish. DDS: One reason you are so successful--apart from the obvious beauty--is that you do one thing only: tabletop. You’re a perfectionist and you are a total specialist. I'm sure you've been asked to add all sorts of products. AM: Diane, you are so astute- that is exactly right. I have been told many times that I should make other things. But unlike other designers, my craft is my passion and it is making glass. Sheets and towels don’t exactly move me, so why do them? The craft of making glass is everything to me. I see the difference. That’s why I have staying power. Maybe I ‘m wrong but I see the difference. DDS: Annie, you started out with 'art glass'. 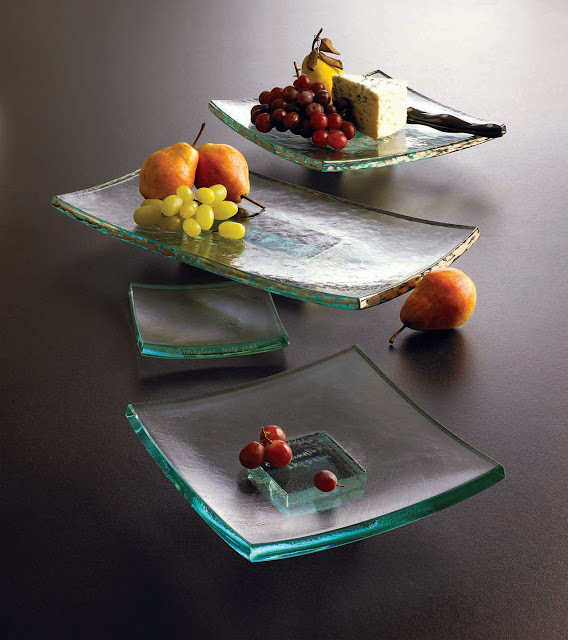 You turned 'art glass' into everyday ornamentation for the table. You made the precious very beautiful for everyday. Bravo to you for all your years of trade shows, traveling throughout the country, persisting, your entrepreneurial spirit, your insistence on working, selling the products, making the products, improving and adding and renewing concepts. I applaud your great success and wish you many more years of happy work and invention and design. AM: Thank you, Diane for the lovely compliments and all your support. You have fabulous style and I am so glad you like Annieglass. DDS: Thank you, Annie. I always knew you would be a great success. You have fantastic focus and you’ve worked very, very hard, while raising your wonderful children. Thank you. Images courtesy of Annieglass, used here with express permission. Annieglass is sold in more than 500 stores around the world, including Chelsea Passage at Barney’s New York, Gump’s in San Francisco, and her store in Santa Cruz, California. Bloomingdale's and Neiman Marcus nationwide (40 stores for each); Barneys New York, Beverly Hills, Chicago & New York; Bergdorf Goodman, New York; Table Matters, Birmingham; Material Possesions, Chicago; Plaid Giraffe, Wichita; Halls, Kansas City; Borsheims, Omaha; Amen Wardy, Aspen; Events, Houston; Gump's, San Francisco. Exquisite is the only word that applies. Thank you for highlighting this amazing woman. I've also had lots of comments via email and through FACEBOOK...so happy for Ann to celebrate 30 successful years. I have been serving soup in her round Roman Antique plates with gold border for ages. Bought them at Bergdorf's. One day all 12 came tumbling down from a top shelf (don't ask) and I loved them so much I picked up the phone and ordered another dozen. They are lovingly stored now on a bottom shelf. You were right...don't cry over broken plates, simply order more and more. I agree with you...the shell plates are gorgeous...lovely to give as a present. "Love the Annie Glass post- her pieces are timeless and her new work over the years is innovative without being trendy. I have the original glass with gold band, place settings for 24 and countless platters, all have aged well and have a warm patina. If I am traveling over holidays and my neighbors are entertaining, they are allowed to borrow the Annie glass, so my collection has actually enjoyed numerous celebrations." Wow...this post was definitely a treat... Absolutely gorgeous pieces. I agree with one of the earlier comments - exquisite is definitely the perfect word!! So beautiful and one can really feel her passion for what she creates. They are marvelous pieces that catch your direct and full attention. I've always been very affectionate aboute glass and as you know Sweden has a long history in glass making. Sadly there are not many manufacturers left and the artisans are therefore becoming more important nowadays. 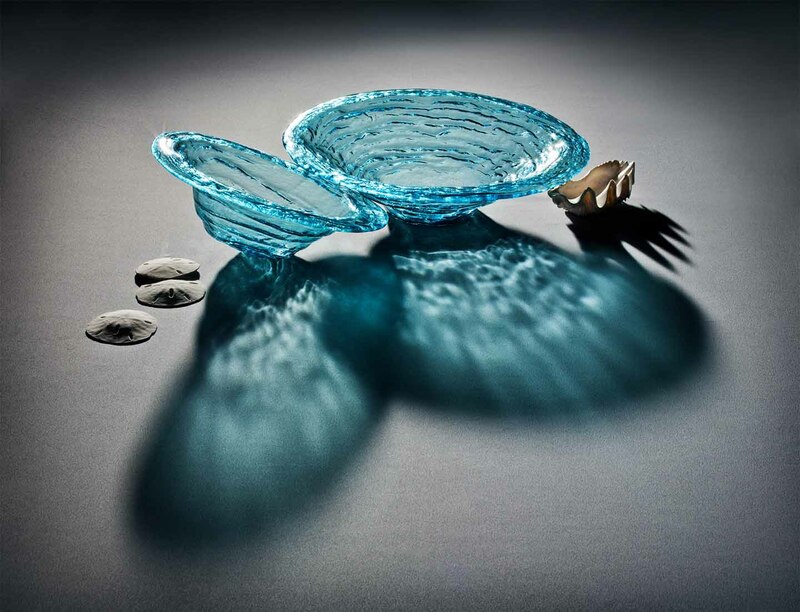 I specially like Annie's Shell Serie for the serenity it brings out. I hope all is well with you, dear Diane! I'm in the middle of a large project, now having a break for vacation and enjoying the best part of the Swedish summer. LOVELY to hear from you and I'm so pleased you are reading THE STYLE SALONISTE. Thank you so much. 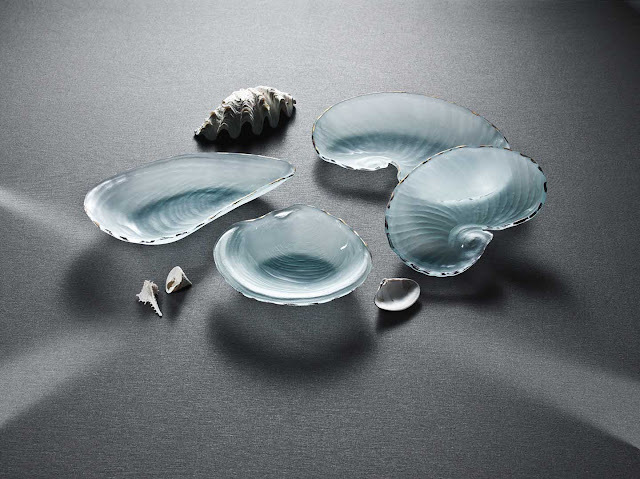 Yes, I agree...the shell series is so elegant and delicate...lovely in person as well and very poetic. Yes...from your point of view in SWEDEN these glass pieces are particularly interesting. Some years ago--I traveled around the 'kingdom of Glass' in southern Sweden...and it was very apparent that while Kosta Boda had a new owner (who was turning the factory etc into a tourist attraction)...many many of the other factories were closing or were only available for tours or were not even open...I was shocked. I am sure it has declined even further now. And yet...Sweden makes some of the most beautiful glass pieces...inspiring designs...but did it let its lead and its moment pass? Was the competition from other countries too strong? Swedish glass...was always the top, a design leader...I have some lovely pieces, and bought some one-of-a-kind pieces on that visit. In the meantime--it is fascinating that in comparison, Ann Morhauser has, for 30 years...created a woman-owned, one-owner company with a distinct and focused point of view. Four hundred points of sale. Large orders from hotels and restaurants. A steady clientele, always admiration for her hard work, the grace of her designs. Ingela--thank you so much for your comments...it puts ANNIEGLASS into perspective and makes it, it seems to me, an even greater achievement.